With Canada legalising recreational marijuana, the coming year could be the one that cements the mainstreaming of cannabis on a global scale. 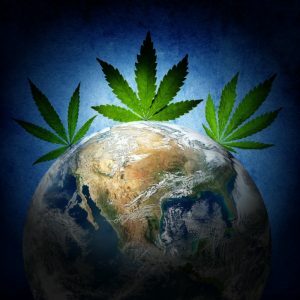 While the substance has long been decriminalized in Portugal and the Netherlands, on 17 October, Canada became the first G7 country to legalise recreational purchase from federally licensed vendors and the second overall, five years after Uruguay did so. In practice, this means adults in Canada can possess up to 30 grams and grow as many as four plants. With legalisation, the country is, in effect, moving towards a landscape in which cannabis is treated similar to alcohol and tobacco, namely, as a highly regulated product intended for adult consumption. But in what could prove the bigger market, health sciences and wellness companies will also be able to handle the plant in much the same way as a standard pharmaceutical product. This will almost invariably lead to greater R&D than ever seen before, as the active ingredients in cannabis are deployed as novel treatments for various diseases and disorders. As a result, the marijuana industry in Canada alone is expected to grow into a multibillion-dollar sector, reaching C$6.5 billion (about €4.3 billion) by 2020, according to research from the Canadian Imperial Bank of Commerce. And companies around the world have been positioning themselves for what appears to be a highly lucrative new dawn for the drug. Canopy Growth, a Canadian player and one of the largest diversified cannabis and hemp companies, has been preparing for the changes at home. But the company also has its eye on a much larger prize—international growth. Just this week, Canopy reached an agreement to acquire Colorado-based medicinal marijuana researcher Ebbu for C$25 million in cash and more than six million Canopy shares, representing hundreds of millions in additional compensation. A recent $4 billion investment from Constellation Brands, the brewer of popular Mexican beers Corona and Modelo, is giving it the firepower to do so. And the company’s growth plans also include Europe. “In Europe, many countries are now being governed by rational and forward-looking individuals,” said Canopy CEO and founder Bruce Linton (pictured) during an interview with PitchBook at a conference in London this month. “The war on drugs was always much more of an American thing than a European thing, and the way and rate of speed the playing field is evolving in Europe is much faster, because they are looking at this in an unemotional way, as a possible job creator and a much better choice to some conventional drugs—we have to be ready to go fast and hard here”. But Canopy is hardly the only player striking big deals in the space, as several US companies have taken advantage of Canada’s public markets to raise capital for strategic transactions. Another recent example is MedMen, a California-based and Canada-listed cannabis retailer that, in a push for scale and integrated supply chains, agreed to acquire medical cannabis provider PharmaCan in an all-stock transaction valued at $682 million. For the year, 194 M&A deals have already closed in the cannabis sector, per the PitchBook Platform, compared to 130 such transactions in all of 2017. Canopy and Aurora Cannabis—another of Canada’s major marijuana companies—have closed a combined 21 deals in the space since the start of 2010. Several stark examples of marijuana’s medical benefits, along with some progressive legislators, have helped shift public opinion in Europe. In the UK, the government appears to be heading for a full-blown policy U-turn on how it views the drug, with an investigation into whether relaxing laws on when cannabis-based medicines can be prescribed by doctors. The move follows the case of Billy Caldwell, a 12-year-old boy hospitalised after he was denied access to the cannabis oil that helped control his epileptic seizures. While Caldwell’s medicine was illegal because it contained the compound THC, new treatments currently being developed contain CBD, a natural and legal cannabinoid with no major side effects that’s perhaps best know for its demonstrated success at treating anxiety and pain. And therein lies the huge potential according to Linton. Introducing treatments that contain CBD is something politicians in Europe are coming around to—fast. While the new legislation makes recreational use legal in Canada, the picture in the US is more nuanced and made more difficult because of the difference between state and federal legislation—something Linton acknowledges, and which Canopy’s recent investment from Constellation will help it address. “The potential to grow in the US is huge, but it’s by no means straight forward,” he said. But if the company’s current math holds up, even the $4 billion Contellation poured into Canopy’s coffers might not be enough. Public sentiment across North America and Europe has evolved at a pace unimaginable just a few years ago. And while legalisation in Canada is in itself a milestone, it is most likely only the beginning, as Europe is already emerging as the industry’s next frontier. But while there appear to be clear advantages for early movers such as Canopy, a number of headwinds and challenges will need to be overcome.